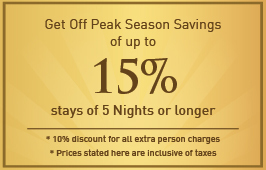 **Minimum stay of 5 nights required for discount. Infants (0-3 years) Free if sleeping on same bed as parents. A baby cot is available at ¥3000 per stay. and 24th February Onwards until end of season. *The rates shown for the apartments are inclusive of the Japanese consumption tax of 8%.